Those people who borrow from Commercial Banks and then “REPAY” their “LOANS” are not aware of their foolishness or of the harm they are doing to the United States. RE-"PAYING” loans from a person that labors to produce goods or services in exchange for MODERN “MONEY” is honorable. RE-"PAYING” loans from institutions that lend only amounts deposited from people who labor to produce goods and/or services in exchange for MODERN “MONEY” is also honorable, BUT RE-"PAYING” “loans” of amounts created by a Commercial Bank is contributing to the relentless destruction of the United States. Those people who have been enjoying the FREE LUNCHES (they told you there weren’t any) have kept their secret well, even now, you do not want to believe that you could ever understand it, BUT hold on and I will disclose it to you in simple language. To do so I will require your patience and attention. Read slow, do not go one word beyond the one that confuses you until you are no longer confused. For contrast which is essential to understanding MODERN “MONEY” I will have to refer to and very briefly explain the significant importance of the role Silver Certificates played in the exchanges of goods and services between the producers and consumers of the United States. I will also have to introduce you to the most unbelievable, stranger than any fiction, truth that ever came to be on Earth — “MONETIZED” debt — (debt accepted by millions as MODERN “MONEY”). Please realize that this book is revealing, in detail, a new advancement in a, thousands of years old, means of a few clever people making virtual slaves out of all the rest of the worlds population without the victim’s knowledge. Having acted foolishly doesn’t feel so bad when you understand that BEING UNAWARE, of a truth, is the PARENT of BEING UNAWARE (those unaware, are unaware, of being unaware). The whole story is revealed in my text book: “Money the Greatest HOAX on Earth,” the “income tax” relationship is revealed in two others: “Everything I have was “THEIRS” and “I.R.S. “Indicted” for FRAUD and EXTORTION.” This book deals with the understanding and justice of how one may obtain everything one wishes with the use of FREE MODERN “MONEY” — represented by those green pieces of paper we all ACCEPT AS BEING the money. There are many who understand the ROLL-OVER technique, by many of its names PONSI GAME, PYRAMIDING, TREASURY BILL ROLL-OVER, DEFICIT SPENDING etc., etc., BUT that is not the theme here. The green pieces of paper we accept as money are non-redeemable and are used merely as representatives of an imaginary medium of exchange you should NOT have to give up anything to get. There is a way to get the MODERN “MONEY” and its representatives, the green pieces of paper, from the Commercial Banks by borrowing them, using them, and then standing ready to accept them back from others for the production and services you offer to others. The Commercial Banks do not offer anything in redemption for those green pieces of paper except other green pieces of paper. The Commercial Banks are issuers of FREE “MONEY” to those who understand the system. In the United States today, it is impossible for anyone to pay monetary debts. The money by which monetary debts could have been repaid has been replaced by a MODERN “MONEY” unit which cannot function as payment for debts. The paper token representing the MODERN “MONEY” called ‘dollar bill’ is labeled, in large print: FEDERAL RESERVE NOTE, BUT it is not a note by definition! In order to be a note the instrument must promise payment which the federal reserve “note” does not. The present day paper token representing money that we refer to as a ‘dollar bill’ looks very similar to the Silver Certificate that was our paper token in the past. The Silver Certificate contained a promise to pay the bearer a one dollar quantity of silver on demand. The present day paper token unit does not promise to pay anything, to anyone, at any time. The obligation to redeem the silver certificate for silver was a contract. The contract specified that payment of the liability, or debt, must be made by the delivery of a dollar quantity of silver. The Certificate had the words “This CERTIFICATE is legal tender for all debts public and private” printed upon it. ‘Legal Tender’ under law is that token which the law authorizes a debtor to tender and requires a creditor to receive in settlement of money obligations. When the paper token was redeemable for silver it was accepted that the silver received was the money and a proper payment for the monetary liability or debt that had existed. The debt or liability was canceled, the instant payment in silver (money) was completed. Monetary liabilities and debts come into being when someone receives production or service and tenders paper or metal tokens instead of production or a service in exchange. The obligation or contract represented by the paper token is fulfilled when silver coin is received in final payment and the paper token is surrendered. The Silver Certificate paper token representing the obligation or contract to settle the liability or debt could be canceled with the payment of silver coin. The present FEDERAL RESERVE “NOTE” paper token accepted mistakenly as representing an obligation or contract to settle a monetary liability or debt cannot be canceled because it does not contain any promise to pay anything. No payment of silver coin or any other commodity is promised therefore it cannot function as settlement or payment of debt. If liabilities, which are debts, are used as the MODERN “MONEY,” it is obvious why it is impossible for anyone to pay their monetary debts. Debt cannot be the money used in payment of itself! Mr. Francis doubts that the creation of the system using debt as money called monetization of debt was a conscious act. He is right. No one in their right mind could accept a concept of considering ‘the obligation to pay’ as the ‘PAYMENT’ itself. A contract specifying payment in modern “money” is an agreement that is impossible to fulfill! A contract is an obligation; an obligation is a liability; a liability is a debt and when the DEBT is considered to be MODERN “MONEY” then the CONTRACT is its own FULFILLMENT! Anyone tendering Federal Reserve “Notes” in PAYMENT of debt is committing Fraud and passing counterfeit. Specifications in the Coinage Act of 1965 allow the Treasurer of the United States to take 97% seigniorage. The Act also acknowledges our present tokens to be ‘legal counterfeit’ by virtue of its containing a penalty of fifteen years imprisonment for NON-SANCTIONED counterfeiting. So we have ‘currency’ (paper and metal tokens) that purchase 100%, but are only worth 3% because of the 97% seigniorage (97% expropriation) of wealth and the Federal Reserve’s “MONETIZED DEBT” representing 100% expropriation of wealth or ZERO WORTH, making it impossible for use as payment of debt. The primary function of MODERN “MONEY” is the expropriation of wealth, as acknowledged by the Federal Reserve Bank of St. Louis, Mo. in their ‘Review’ of February 1975. Referring to 97% expropriation of wealth as a “tax” is unconscionable! One group of clever individuals (owners of the private institutions that make-up the fed.) able to “tax” all the non-bank public as their slaves! The so-called MODERN “MONEY” by its own specification CREATES debt by the expropriation of wealth in excess of 97% in metal token form and at 100% in the form of bookkeeping entries whenever it is accepted in exchange, therefore it certainly cannot, by any stretch of the imagination, be used in payment of debt. Any attempt to use MODERN “MONEY” IN PAYMENT of a debt only succeeds in increasing the debt by double, or nothing less than 97%. The nature of this FRAUD can only be observed from the aspect of the HOLDER of MODERN “MONEY.” Upon receipt of it in exchange for production or service the receiver is victim of 97% or greater loss of wealth and will remain a victim of that loss as long as the token is held. If the holder passes it on to another for wealth the holder is compensated for the wealth that was offered originally in exchange for the token and the new holder becomes a victim. As the process repeats itself over and over again the expropriation of wealth, by the small group of very clever issuers of these tokens, remains unnoticed by the mass of producers, and will not become noticeable as long as the MODERN “MONEY” freely exchanges for goods and services. Very few people realize that the initial expropriation of wealth can never be replaced to the final last holder of the MODERN “MONEY” BEYOND 3% and then only if it is held in the metal token form. A MODERN “MONEY” UNIT IS NO BETTER THAN A 97% BAD CHECK! A bad check is eventually presented for payment by being deposited. At that point the bad check does not clear and is returned through its list of endorsers to the issuer who has to redeem it. Paper tokens without promise of payment cannot ever be canceled, therefore they accumulate in the hands of holders who bid them in ever increasing amounts for the units of production; raising prices. Because the greater part of wealth expropriated by their issuer is consumable goods which are consumed at ever increasing prices, the need for more MODERN “MONEY” to spend increases, for government, beyond the I.R.S. extortion take. To finance “DEFICIT” spending more monetization of debt must take place. The new amounts created add to the accumulated total and the MODERN “MONEY” UNITS are bid in still higher quantities per unit of produced goods, forcing prices to rise higher and higher. This accumulation is another proof that the new MODERN “MONEY” as monetized debt cannot be used in payment of debts and any attempt to do so only increases the debt volume. PAPER TOKENS BY THEIR FUNCTION OF REPRESENTING MONEY CANNOT BE MONEY! METAL TOKENS THAT CONTAIN ONLY 3% OF WORTH IN COMMODITY VALUE CANNOT BE 100% FACE VALUE OF THE MONEY IT REPRESENTS! AN OBLIGATION BY ITS NATURE AS A BINDING CONTRACT CANNOT BE MONEY! WHATEVER AT ANY TIME MAY BE CONSIDERED AS MONEY BY ITS VERY ABILITY TO PAY DEBTS CANNOT BE DEBT! MONETIZED DEBT IS AN IMPOSSIBLE CONCEPT! IF MONEY IS AN ASSET, AND DEBT IS A LIABILITY; FOR DEBT TO BE MONEY — AN ASSET WOULD BE A LIABILITY! WITHOUT A PAPER TOKEN PROMISING PAYMENT OR A COIN OF FULL COMMODITY VALUE THERE IS NO WAY A PAYMENT OF MONETARY DEBT CAN BE ACCOMPLISHED! WHETHER AN EXCHANGE INVOLVES PRODUCTION FOR PRODUCTION, SERVICE FOR SERVICE, PRODUCTION FOR SERVICE, OR SERVICE FOR PRODUCTION, THE BASIC, FUNDAMENTAL EXCHANGE TAKING PLACE, IS ONE OF ‘THE RESULT OF HUMAN EXERTION’ BEING OFFERED BY ONE PARTY TO RECEIVE ‘THE RESULT OF HUMAN EXERTION’ FROM THE OTHER PARTY! A DEBT, VERY SIMPLY, IS THE UNDELIVERED PORTION OF AN EXCHANGE. A DEBT THEN, BY ITS VERY NATURE OF BEING THE UNDELIVERED PORTION OF AN EXCHANGE CANNOT BE THE DELIVERED PORTION AS WELL! ‘MONEY’ was a word applied to any and all tangible things that throughout history were used as mediums of exchange. When any tangible thing was in common use as a medium of exchange it was said to be monetized. The usual attribute of any “monetized” tangible thing was its ability to hold its exchange value rather stable over long periods of time. The people just naturally accepted as mediums of exchange the ‘thing’ that appeared to retain a most stable exchange value and this was called a STORE-OF-VALUE and the ‘THING’ was called ‘MONEY.’ The word ‘money’ was an abstract term applied to a tangible thing. Today: Times have changed! We no longer use anything tangible. Front Page Wall Street Journal September 24, 1971. If the economists do not know what ‘money’ is — how did the economists determine that the banks create the money? If the economists do not know what ‘money’ is — how come two hundred million people think they do know what ‘money’ is? If the economists do not call the paper and metal tokens in use today ‘MONEY’ — what do the economists call the paper and metal tokens in use today? There is certainly a great deal of confusion! The paper and metal tokens in use today are printed and minted by government, but the economists say ‘MONEY’ is created by banks. Two hundred million people today use the paper and metal tokens in the economy and call it money. Economists use the same paper and metal tokens, BUT say they do not know what money is! THE ECONOMISTS KNOW SOMETHING THAT THE PUBLIC DOES NOT KNOW. THAT IS THE ONLY POSSIBLE CONCLUSION THAT CAN BE DRAWN! Scientific investigation discloses that the economists are correct from a technical standpoint. The “MONEY” is in reality a creation of the Commercial Banks. Demand liabilities of Commercial Banks are ‘money.’ The ‘deposit credits’ created by the banks accepting commercial paper are ‘Demand Liabilities’ and are the actual “money.” The paper and metal tokens used by the people outside the banking system are the tangible things that represent the “money.” From the practical viewpoint of the public the tokens in use, acting by proxy for “money” is ‘money’ to them. FOR THE ECONOMISTS “MONEY” IS AN INTANGIBLE OBJECT OF THOUGHT: WHICH IS A SCIENTIFICALLY CORRECT CONCLUSION! FOR THE PUBLIC “MONEY” IS THE TANGIBLE TOKENS (PAPER AND METAL) THEY USE IN THE ECONOMY, WHICH IS A SCIENTIFICALLY FALSE CONCLUSION! LET US EXAMINE THE UNBELIEVABLE TRUTH IN THE MANNER THE PRESS SHOULD. HOW — IS MODERN “MONEY” CREATED? WHEN — IS MODERN “MONEY” CREATED? WHERE — IS MODERN “MONEY” CREATED? BY WHOM — IS MODERN “MONEY” CREATED? WHY — IS MODERN “MONEY” CREATED? ‘Modern money’ is a psychological concept existing as an intangible object of thought in the non-bank public’s mind. ‘Modern money’ is created by ‘making-believe’ that a deposit of a ‘medium of exchange’ has been made and recording the deposit, when in fact no deposit has been made. This ‘credit’ for a deposit that is recorded without any tangible ‘medium of exchange’ existing is called a ‘Deposit Credit.’ The justification for creating the ‘deposit credit’ is the Commercial Bank receiving from an individual member of the non-bank public (borrower) a note or other form of commercial paper and a promise to ‘pay back’ the bank’s credit at a later date. The ‘deposit credit’ entered in the borrower’s account allows the borrower to use the created, psychological, ‘medium of exchange’ in the economy in exchange for tangible, physical production and services. The accepted concept is that if and when a borrower uses the deposit credit (imaginary medium of exchange) in the economy in exchange for production of service he will issue a check to the merchant. The check is a written order to his bank that will transfer his ‘deposit credit’ to the merchant from whom the borrower received the production or service, when the merchant deposits the check. The written order (check) received by the bank directs them to transfer the ‘deposit credit’ from the borrower’s account to the account of the merchant. Because of this requirement to transfer the ‘deposit credit’ it becomes known as a ‘DEMAND LIABILITY’ of the commercial bank (the owner of the claim, whether original borrower or merchant-receiver can demand its transfer). The ‘DEMAND LIABILITY’ infers that the bank owes the borrower or merchant ‘claim holder’ the use of the ‘deposit credit’ as an imaginary ‘medium of exchange’ ON DEMAND. The entire system becomes a series of ‘account entry transfers,’ one after the other, forming a record of ‘who owes who.’ The demand liability concept with the right of the claim holder to order the deposit credit’s transfer ON DEMAND allows the non-bank human mind to see a condition corresponding in-a-way to the old Gold or Silver Certificates which were claim checks on gold or silver coin deposits that were redeemable ON DEMAND. MODERN “MONEY” has become the exclusive “money” in use in the United States since June 24, 1968. The actual process of money creation takes place in commercial banks. Demand liabilities of commercial banks = “money." Demand liabilities = record of debt = “money." The process is called: The Monetization of Debt! The more you BORROW — the richer you become. The deeper in debt you go — the higher the standard of living you can afford. Using debt as ‘money’ reverses the historical behavior patterns of the economy. Borrowers cannot pay-off a debt with a debt and the borrower appears to get richer as the records of debt (who owes who) rises. DEBT AS “MONEY” NEGATES THE SETTLEMENT OF DEBT. The deeper in debt a borrower goes, the better his standard of living becomes, but the volume of debt (“money”) keeps increasing with time. “Money” (demand liabilities of commercial banks) are records of debt that grow in volume daily as debt (“money”) is borrowed (the increasing who-owes-who record). IT IS A FUTILE ATTEMPT TO BORROW ONESELF OUT OF DEBT — IT IS IMPOSSIBLE. THEREFORE: THE VOLUME OF DEBT (“MONEY”) GROWS DAILY AT AN EVER INCREASING RATE. As the volume of debt (“money”) accelerates, its exchange value falls. This drop in the purchasing power of the paper tokens that represent the debt (“money”) is referred to as “Price Inflation". The necessity to pay debts (“money”) with debts (“money”) is an IDIOTIC conception and requires an effort to repeatedly borrow greater amounts to settle amounts already existing and is referred to by the ‘Con Man’ as the Ponsi Game Scam. INTEREST IS THE PERPETUATING FORCE OF DEBT MONETIZATION! At the instant of borrowing — the borrowed debt (“money”) becomes new debt with an interest requirement. The non-bank public is TRAPPED. The system requires that it constantly expand to function (the increasing record of who-owes-who). The attempt to borrow oneself out of debt, borrowing a greater NEW AMOUNT to “pay-off” the OLD AMOUNT, constantly postpones the inevitable. It is known as ‘rolling over’ the debt (“money”). There isn’t any way to pay the interest because you cannot RETURN to an ONLY SOURCE MORE then you BORROW from it; so the system is self perpetuating until it collapses; with the interest requirement as the perpetuating force. NO HUMAN HAS EVER SEEN, HEARD, TOUCHED, TASTED, OR SMELLED ANY “MONEY.” THE PHYSICAL PROPERTIES OF “MONEY” ARE 100% PSYCHOLOGICAL. Demand liabilities of commercial banks are money. Demand liabilities are records of debts and are money. Commercial bank records of debt (“money”) are entered on the books of the bank. The bank’s books remain in the bank therefore “money” remains in the bank — it never leaves the system. The records of debt can be altered and/or shifted from one account holder to another by request. Written requests to shift demand liabilities (“money”) from one account to another are called checks. Checks are no part of the debt or “money” volume but merely the written instrument bearing instructions directing the shifting of ‘claim’ to account amounts in the ledgers of banks. Checks tendered in the economy during exchanges are paper tokens used to physically represent “money.” Legal Tender “notes” are also paper tokens used to physically represent “money” (debt). The copper-nickel alloy metal tokens and legal tender “notes” are physical, tangible proxies that serve as a way for the holders of “money” (debt) in the banking system to PHYSICALLY shift about the claim on the accumulated debt (“money”) RECORDS of the system. THE COPPER-NICKEL ALLOY METAL TOKENS AND LEGAL TENDER “NOTES” OF PAPER ARE NO PART OF THE “MONEY” (DEBT) VOLUME. The tokens are obtained from the system by shifting a demand liability record from the credit of a depositor to the credit of the banker in exchange for the tokens. The tokens leave the bank but the record of debt (“money”) remains on the books. The record of debt (“money”) remains as a demand liability recorded with ink on paper as ‘marks in a book’ and in the economy by paper and metal tokens which physically represent the psychological entity (book entries), (“money”), (intangible objects of thought). The physical properties of an intangible object of thought are 100% psychological therefore no human has ever seen, heard, touched, tasted or smelled any “money,” even the marks on the books of banks merely RECORD the intangible object of thought (a make-believe medium of exchange). Tokens removed from the system by a sacrifice of demand liability by one individual member of the non-bank public can be returned by another member who will then have the originally sacrificed demand liability transferred to his account, in exchange for the tokens. Paper and metal tokens are obtained from the bank upon transfer of record of debt from holder to bank. The record of debt (“money”) does not leave the bank; it is merely transferred from one account to another within the bank. The depositor gives up claim on part of his record of debt (“money”) and it becomes the claim of the banker in exchange for the tokens. When paper and metal tokens are deposited in the bank a record of debt (“money”) is transferred from the banker’s account to the account of the depositor. The banker gives up claim on part of his record of debt (“money”) and it becomes the claim of the depositor in exchange for the tokens. The record of debt (“money”) does not come into the bank from the outside (tokens came in) the record is merely transferred from the account of the banker to the account of the depositor. A RECORD OF DEBT (“MONEY”) CANNOT COME INTO THE BANKING SYSTEM FROM THE OUTSIDE BECAUSE IT NEVER LEAVES THE BANKING SYSTEM WHERE IT IS CREATED. "MONEY” (RECORD OF DEBT) A DEMAND LIABILITY OF A COMMERCIAL BANK IS CREATED IN THE BANK’S BOOK AND REMAINS IN THE BANKING SYSTEM THROUGHOUT ITS LIFE SPAN. "MONEY” (RECORDS OF DEBT) CAN BE SHIFTED FROM DEBIT SIDE TO CREDIT SIDE IN LEDGERS OR BY JOURNAL ENTRIES SHIFTED FROM ACCOUNT TO ACCOUNT WITHIN THE LEDGERS OF BANKS BUT IT CAN NEVER LEAVE THE BANKING SYSTEM. Paper and metal tokens, for distribution, are fabricated by government and enter the banking system in exchange for claims on records of debt (“money”) created by the commercial bank. It sounds very simple, BUT the procedure is much more devious. Treasury bonds, created by the treasury in violation of the Constitution, are exchanged for claims on demand liabilities of commercial banks (“money”) held by the non-bank public. People using checks transfer their claims on demand liabilities (“money”) from their accounts to the Treasury’s accounts to acquire the bonds. The banking system acquires the Treasury’s bonds from the non-bank public using the bank’s claim on demand liabilities (“money”). The Treasury bonds earn “interest” and are an investment by the bank. The bank transfers their claims on demand liabilities (“money”) to the public in exchange for the Treasury’s bonds. When the Treasury’s bonds are in possession of the Federal Reserve System (the commercial bank members of the Fed.) they are considered as being the ‘BACKING’ for the government’s credit and justification for the issuance of tokens (‘Fed.’ “notes” and copper-nickel token coins) from the Treasury to the ‘Fed.’ for distribution by the Federal Reserve System (the commercial bank members of the ‘Fed.’) to all other banks and to the public. This completes the devious subterfuge and makes possible the sincere belief on the part of the public that the paper ‘Fed. “notes"’ (“dollar bills”) and the copper-nickel token “coins” are the ‘money’ and that they (the tokens) are “BACKED” by the full faith and credit of the government bonds. Which is a false conclusion. William Patterson, International Banker 1694. The banking system operates on the premise that there is nothing wrong with creating “money” if the collateral is there to “BACK” it. Just as the Treasury issues the tokens as being “BACKED” by their bonds. The exact premise is that the bank creates the “money” for people to use until they exchange their production or services in the economy and can RETURN the “money” borrowed. But the actual creation of “money” (deposit credits) which become the demand liabilities of the commercial banks; creates a ‘medium of exchange where NONE EXISTED BEFORE and for which NO ONE HAS LABORED. A ‘medium of exchange’ created — in the words of William Patterson 1694 — “out of nothing,” BUT which is fully usable and acceptable in the economy when represented by proxy by the physical paper and metal tokens. 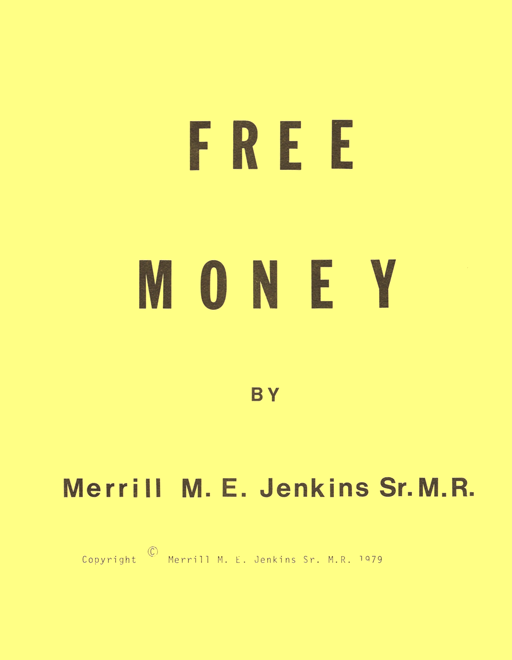 The created “money” is used in the economy exchanging for the services and production of the non-bank public expropriating their wealth, for which they DID labor, and transferring the title to that wealth to the creators of “money” (the commercial banks) who did not perform any physical service or produce any tangible production. Using debt as a medium of exchange, and all debt being demand liabilities of the commercial banks regardless of who produces what product or performs what service, if that product or service is exchanged for debt (“money”) the value it represents is owed to the commercial banks by someone. “MONEY” EXPROPRIATES WEALTH FROM THE NON-BANK PUBLIC! It is the expropriation of production and services from the economy without the equivalent removal of the ‘medium of exchange’ (debt), because debts cannot be paid with debt, that causes the ever increasing amounts of debt (“money”) that must be bid in competition to obtain the production and services being offered. Debt as the ‘medium of exchange’ (“money”) continues to accumulate as additional borrowings take place and the amounts of “money” bid, per unit of production or service, are influenced by the ‘total amount’ of the accelerating volume that is “in the hands of the public” during any given interval. Those amounts which find their way into various ‘fundings’ (pension funds, strike funds, and escrows of all types) do not cause this “prices rising” effect. The claims on demand liabilities that are transferred into the pension funds or typical other accounts during any given interval are not considered to be part of the “money” volume. “Money” funded in those accounts is NOT IN THE HANDS OF THE NON-BANK PUBLIC, and is not being bid for production or services and has no “price rising” effect on the economy. THE NON-BANK PUBLIC CAN ONLY OFFER IN EXCHANGE THEIR CLAIMS ON THE DEMAND LIABILITIES IN THEIR ACCOUNTS AND THE TOKENS THEY HAVE THAT CAN BE EXCHANGED LATER BY A MERCHANT FOR THE CLAIMS ON DEMAND LIABILITIES OF THE BANK WHERE IT MAY BE DEPOSITED. “MONEY” NOT BID DOES NOT CAUSE INFLATIONARY EFFECTS. THE COMMERCIAL BANKS CREATE THE “MONEY;’ LEND IT TO THE NON-BANK PUBLIC FOR PROFIT (“INTEREST”) WHICH, BECAUSE IT CAN NEVER BE PAID, PERPETUATES THE SYSTEM UNTIL THE SYSTEM COLLAPSES. THE NON-BANK PUBLIC PLAYS THE GAME BECAUSE THEY CAN BORROW AND TO ALL APPEARANCES RAISE THEIR STANDARD OF LIVING BY LIVING BEYOND THEIR MEANS. IT APPEARS TO ALL THE WORLD THAT THEY ARE GETTING SOMETHING FOR NOTHING. In reality society does not get something for nothing, BUT the commercial banks (Federal Reserve System) gets EVERYTHING FOR NOTHING! By now you should understand who gets the FREE LUNCHES and how they do it. By now you should have formulated some ideas concerning the vulnerability of such a system. By now you should have realized that the non-bank public could use any common item of their own production as a medium of exchange and eliminate forever this abomination called a Monetary Authority, BUT that requires legislation. SINCE WE ARE FORCED BY LEGAL TENDER ACTS TO USE THIS UNFUNDED PAPER WE SHOULD AT LEAST GET IT FREE! THEY HAVE TOLD US NOT TO WORRY ABOUT THE HUGE ACCUMULATION OF DEBT BECAUSE “WE OWE IT TO EACH OTHER” PERHAPS THEREIN LIES THE SOLUTION TO OBTAINING FREE MONEY. BY NOW YOU SHOULD BE ABLE TO READ THE FOLLOWING RECAP AND FOLLOW ITS LOGIC AND REASONING TO THE OBVIOUS MEANS OF OBTAINING FREE MONEY THAT IT JUSTIFIES. Federal Reserve Bank of New York, The Story of Money, p. 19. A bank credit card is a token representing a prearranged agreement for the bank to “create” dollar quantities of imaginary debt, in the card holder’s account, if and when the card’s option is exercised, combined with the order to transfer that record of imaginary debt to the merchant’s account, at his bank, after the sale is recorded. The “debt” “created” at the card holder’s bank is imagined because “… money’s true value is its purchasing power — its ability to buy goods and services.” (above quote) And until it is used to purchase goods or service it does not have any value. Banks do not give up any thing of value to get the money. Banks do not produce any consumable goods. Money’s value begins when it is used to purchase goods or service. The merchant that sells goods for the money is in turn reimbursed upon using the money to purchase from another merchant. Money is an intangible (unreal) medium of exchange that is Legal Tender (legal to offer) and nothing more. Each merchant in turn has to provide goods or service to acquire coin or currency “Legal Tender,” which is mostly Federal Reserve notes. The Fed. notes are accepted by each merchant or laborer in turn because of their continued confidence that they will be able to exchange them for real goods and services at any time. Borrowing from a commercial bank is nothing more than a formality. Any contractual obligation to repay is void unless something of value changed hands. Any feeling of obligation would have to be imagined. “… it is the confidence people have …” that gives “value” to Fed. notes that haven’t any value in themselves and cannot be “redeemed” or exchanged for anything of value at their source. Fed. notes are pieces of paper that serve only as tokens to represent an unreal (intangible) medium of exchange, and whose only “value” is their continued acceptance by people with confidence. A “dollar” is the make-believe monetary unit of the United States, paper and ink records of numbers preceded by a ‘dollar’ sign ($) in bookkeeping entries, accepted by the public as imaginary mediums of exchange whose quantity increases daily with official and individual borrowings; are seigniorage, credit, inflation, money, and totally intangible, cannot be sighted, heard, smelled, tasted, or touched; can exist in human thought only, and are shifted about by check, currency and credit card to “settle” debts by imagination. These imaginary “dollar” units are represented by Fed. notes. A Fed. note is a paper token, as evidence of a created “dollar” quantity of imaginary debt written as a number on the books of a bank, are printed at the bureau of engraving and printing on orders of the Treasury, countersigned by officials of the Treasury, turned over to the Fed. for distribution and accepted by the “borrower” as mediums of exchange for goods and services that are worth over a thousand times greater in value than the “worth” of the Fed. note itself. Obtained at the commercial bank by “borrowing,” Fed. Notes haven’t any value as commodities. “A dollar bill is just a piece of paper.” (quote above) When Fed. notes are used to purchase something of value, then their value becomes that purchasing power. At the time of “borrowing” their ‘value’ “has little but bookkeeping significance,” their value depends on confidence and that confidence is not guaranteed by redeemable backing; until a purchase is accomplished the confidence might be unjustified. “Buying” and “selling” with money is nothing more than a gigantic confidence game. Money is just a medium of exchange that doesn’t have any value itself except to the one who gave something for it and then only if its holder can obtain something of value from someone else with it. Its nature is such that the formality of “borrowing” is far overdone. Like Poker Chips, Fed. Notes only have “value” when a holder has parted with some thing of value to obtain them. When he passes them on for some thing of value from someone else they become its new holder. They only have “value” to the holder that gave some thing of value to get them. The bank gets them in deposits from merchants who gave something of value to get them. When the “borrower” gives something of value to get them from the bank the cycle is continued. When the “borrower” spends them he is reimbursed and the cycle is continued. If the “borrower” should spend the Fed. notes at the exact same merchant that deposited them a cycle would be completed. When bank credit cards are used the system is quite different. The bank issues the card without receiving anything of value from the card holder. The card hasn’t any value until it is used to purchase something of value from a merchant. When the sale is recorded at the bank the merchant has a deposit credit with which he can purchase. When the merchant purchases with the deposit credit he is reimbursed for the credit card holder’s purchase. The person HE purchases from gets the transferred deposit credit and the cycle is continued. When eventually the original CARD HOLDER ACCEPTS a deposit credit check for something of value HE created — the cycle is completed. Whether it is Fed. notes or credit cards the “dollars” they transfer about are only imaginary mediums of exchange. The only time any “borrower” would “have” to return “borrowed” Fed. notes to a bank would be if the “borrower” wished to “buy back” the thing of value he brought to the bank when he “borrowed” the Fed. notes. In the case of credit cards they are only a medium of exchange facility like Fed. notes “borrowed” from banks without a pledge of wealth requirement. Any money “borrowed” from the commercial bank without giving anything of value to get it is just a medium of exchange without value or obligation until it is used to purchase something of value. The borrower’s willingness to accept modern money for the things he produces and/or the labor he performs is the key to the system being able to “work” at all. The formality of “borrowing” is necessary to keep the purchasing power stable. If the public were allowed to use all the money they wanted to, the purchasing power would fall. This is a false conception which has been proven by money’s inability to maintain its “value.” It is not the quantity of money that gives it more or less value, it is the quantity BEING BID for goods and services that raises or lowers its purchasing power. If the commercial banks could NOT create money to buy I.O.U.s UNLESS THEY produced goods and performed services FOR MONEY, then, the money’s value would remain stable. A healthy money depends on balancing the growth of the money quantity with the COMMERCIAL BANKS’ ability to produce goods and services. The quantity of money the people have; they got working for it — it was PAID FOR as received. The imbalance has always been the commercial banker HAVING money he did not pay for. It is monetizing I.O.U.s that creates FREE money; to cause IMBALANCE! Federal Reserve Bank of New York, The Story of Money, back of Front Cover. 14,700 commercial banks CREATING money and not one of them ACCEPTING money for ANY produced goods or performed service. This whole mess, because we could not see that no one should CREATE money — that does not ACCEPT money — for goods and services. It is the producers willingness to accept money that gives it value. Commercial bankers creating money, but not producing anything to accept money for, is making it WORTHLESS. Money’s only value is its purchasing power. How can commercial bankers’ created money, which is not accepted by them for goods and services, measure and hold a value it NEVER had? Since money has no value until a borrower is willing to accept it for his goods and services — why do we think we owe the commercial banker anything? THERE IS THE PROOF POSITIVE — IT IS THE BORROWER’S "… PRIVATE IOUs … “ THAT ARE “MONETIZED” (RECORDED SO THEY CAN BE SPENT) THEY DO NOT HAVE ANY VALUE — UNTIL THEY ARE USED TO PURCHASE — SO WHAT WOULD THE BORROWER "… REPAY … “ AND TO WHOM? For a ‘debt’ to “exist” there must be an INCOMPLETED exchange; debt IS the UNDELIVERED parity of an exchange. For the ‘debt’ to be settled the equivalent parity must be delivered. “… Banks create money by “monetizing” the PRIVATE DEBTS of businesses and individuals.” We are to assume, from that direct quote, (above) that debt (the undelivered parity of an exchange) — by some mysterious process called “monetizing” — becomes the delivered equivalent parity as well. DEBT AS DEBT IS THE UNDELIVERED PARITY OF AN EXCHANGE, DEBT AS MONEY IS THE DELIVERED EQUIVALENT PARITY OF AN EXCHANGE, MONETIZED DEBT IS AN INCONCEIVABLE CONCEPT! Taken literally it hasn’t any purchasing power; only a power to be offered (tendered) for debt settlement. Until an exchange had been arranged and partially concluded there could not be any debt established — to be settled. Although ACCEPTED as money — the Fed. “Note” cannot BE money because “money” has a unique ability called PURCHASING POWER. “Money,” then, has the POWER to CREATE DEBT; since it can command other goods, but is valueless itself. Money has purchasing power, but NO VALUE — WITHOUT PURCHASING POWER!! Fed. “Notes” must be accepted as a tender for debt, but are not “money” — so therefore — DO NOT HAVE MONEY’S UNIQUE ABILITY CALLED PURCHASING POWER. WHAT THING HAS PURCHASING POWER? WHAT THING CAN FORCE THE PUBLIC TO OFFER ITS PROPERTY AND RIGHTS? OFFER means to present for action or consideration; propose; suggest; it is a voluntary act. What THING can ‘FORCE’ anyone into a voluntary act of offering. The words FORCE and VOLUNTARY are exactly opposed and it is by the acceptance of this impossible concept of ‘VOLUNTARY FORCE’ being ‘PURCHASING POWER’ that makes the public believe that SOMETHING must BE ‘money’ and HAVE this unique power. It is not a mystery — it is NOT! There isn’t any THING called money! Real or imagined there isn’t any THING called money! A THING can be an ‘object of thought.’ A “MERMAID” is an OBJECT of thought. What is the OBJECT ‘money’? A “UNICORN” is an OBJECT of thought. What OBJECT represents the imagined entity money? You can see a copper-nickel coin and it is 3% wealth — which represents 3% of parity, but WHAT OBJECT — real or imagined — REPRESENTS the 97% of parity that is NOT represented? How does anyone conceive an inconceivable entity? ‘Money, is imagined to exist when in fact it does NOT! ‘Money’ is represented by a perceived differential between the commodity values of the token representing money and the thing “purchased.” “Money” is the missing parity between the commodity value of the “money” token and the commodity value of the thing offered. The “perceived” differential in value is not a tangible thing. It is not responsive to the five human senses, but by a process of manipulation of numbers in double entry bookkeeping system it appears to function as a medium of exchange. At one time Gold and Silver coin (specie) was called ‘money.’ Now throughout the world an imaginary medium of exchange has replaced the specie with a modern FREE “MONEY.” To put the whole simple truth into perspective and to provide the necessary contrast or frame of reference we must examine the word ‘PARITY’ as it relates to a medium of exchange (barter and/or “money”). ANYTHING ACCEPTED IN EXCHANGE FOR USE IN SUBSEQUENT EXCHANGES. ANYTHING ACCEPTED IN EXCHANGE THAT IS EQUAL IN PARITY TO THE THING OFFERED. ANYTHING ACCEPTED IN EXCHANGE IN LIEU OF A PRODUCT OR A SERVICE; NOT EQUAL IN PARITY TO THE THING OFFERED. “MONEY” can be a medium of exchange, BUT cannot be called barter! Barter (medium of exchange with parity) such as gold or silver coin called ‘money’ ‘works’ at all times because of its historic subjective value to its holder.